Jewellery shop, car transport, boat trips, joik performance, and silver courses. Our jewellery shop and small smithy Koru Laakso is located in the centre of Hetta (Enontekiö), were we sell traditional Lappish jewellery, made with the finest craftsmanship. 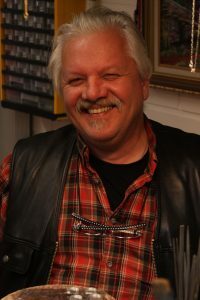 The owner, Tuomo Laakso, has been making these beautiful pieces of art out of gold and silver since 1980. We are taking orders for our products in the shop directly or via email. We are also mending your precious jewelleries and give them a look as if they were new. Further we sell other kind of latest fashion jewelleries and quality souvenirs. If you are interested in learning how to make your own jewelleries, we are most happy to organize courses. During the hiking season we offer boat trips from the centre of Hetta to the other side of lake Ounasjärvi, where the hiking trail through the Pallas-Yllästutunturi starts. For your convenience, we also offer to transfer you car from Hetta to Pallas – or vice versa. On demand, Tuomo Laakso is also performing traditional joiks songs.